How to install mydlink services plug-in on Windows Internet Explorer? 1. 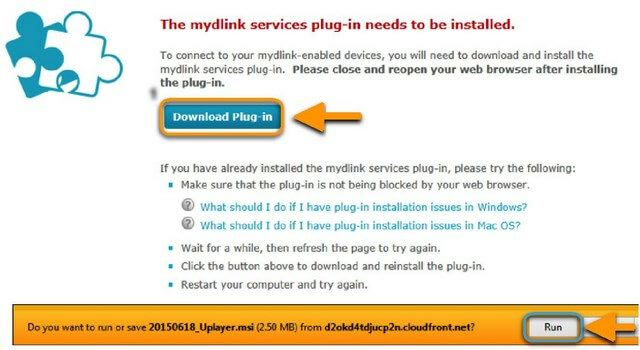 Click “Download Plug-in” to install mydlink services plug-in for your Internet Explorer. Click the Run button to start to install. 2. Click the Run button to install the mydlink services plug-in on your computer. 3. After installing mydlink services plug-in successfully. Please close the browser and Reopen the browser. Then you may enjoy mydlink cloud service. Applicable to IE 8 on Windows XP, IE 8/IE 9 on Windows Vista, IE 8 and higher version on Windows 7, and IE 10 and higher version on Windows 8. How to configure Internet Explorer to allow ActiveX Controls for my D-Link mydlink camera? Step 1: Open Internet Explore browser. Step 2: From the Menu Bar, select Tools and then-Internet Options. 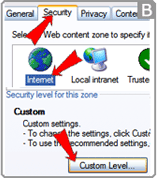 Step 3: Click on the Security tab, select Internet, then click on the Custom Level button. Step 4: Please check the settings of ActiveX controls and plug-ins. Note: If you have antivirus or firewall programs running, make sure they are not blocking ActiveX controls from being downloaded or running. 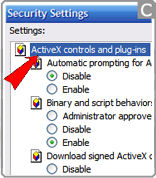 Make sure that you have administrative rights before installing the ActiveX controls.